A participant reading at a Get Lit event. J.K. Fowler talks about literature as if it were a delicate houseplant he tends to diligently. As an editor, he turns the same observant eye towards his work. When Fowler founded Nomadic Press in Brooklyn in 2011, he did so on the tenuous ideology of continuous movement — a notion both unusual and seemingly irreconcilable with the permanent vision of a book press and physical workspace. How can one promote fluid exploration of language and thought when the target is literally a hard-copy? Fowler and rest of his cohorts at Nomadic Press answer this challenge by treating literature very much like it is a living thing, whose germination is as important a process as its final creative product. I spoke with Fowler in a hip cafe in Oakland, the kind that not so subtly screams of gentrification with its offer of $9 toast and selection of IPAs. Although he could easily fit into the Oakland stereotype — with his facial hair and seeming predilection towards button-downs — the first thing I noticed was his intense self-awareness. He understands the implications of being an artistic venue trying to set up in a community struggling with ongoing displacement. He emphasizes the importance for Nomadic Press of being a safe space, of interacting and forging a true relationship with the surrounding area rather carving out its own space. He told me about Austin Square, a creek-side parcel of land the press adopted next to Nomadic Press’ Fruitvale location. Working alongside the Fruitvale community and various organizations, such as Oakland’s Community United for Restorative Youth Justice, they have cleared debris, painted murals, and planted several plants native to California. When it comes to authors, Nomadic’s approach is also local. In 2016, they published Profeta Without Refuge, an experimental and Afrocentric poetry book by St. Mary’s College associate professor Raina León. This past year’s roster included Quiéreme, a book of essays by popular San Francisco queer Latinx writer Juliana Delgado Lopera. The priority on community is perhaps what fuels Nomadic’s impressive array of donation-based events. Crucial to those events is the “Get Lit” series, a reading held every third Tuesday of the month at Ale Industries, a converted warehouse brewery adjacent to the Fruitvale BART station. Fowler, in tandem with multidisciplinary artist Annelyse Gelman, began the series the same year they opened their uptown Oakland space. This past July’s event marked its 26th occurrence. Like with every Nomadic event, the emotional comfort of the writers and audience is priority. 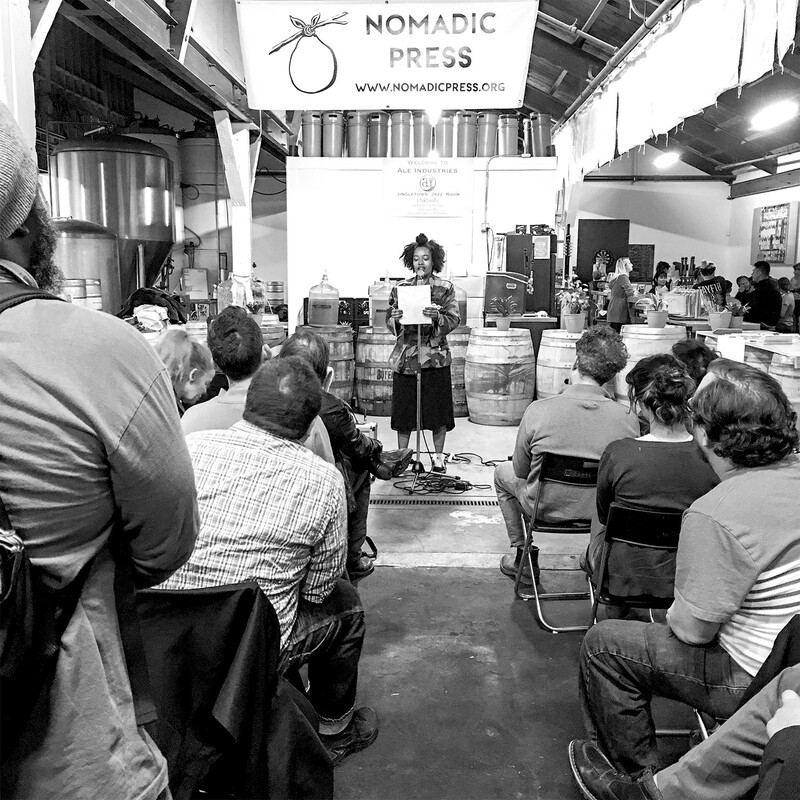 An eclectic audience sips on Ale Industries’ impressive tap — or coffee from Red Bay Coffee’s headquarters next door — clapping and delighting in the thoughtful work of various Bay Area writers. However, “Get Lit” also pushes its participants to an uncomfortable place: read never-before-read work for three minutes in front of a crowd. Fowler and his cohorts cull a lineup of writers touching upon each tribe of the Bay Area writing scene. Together, they create a cozy climate able to dig into the broader questions which short pieces of writing can so perfectly encapsulate: “Who am I since my brother’s death?” asked participant Jenna Robinson. “Why does Lana del Rey always sound so seductive?” posed another participant Natasha Dennerstein. As I nurse an Ale Industries specific IPA with the playful name “Uncle Jesse,” two musical performers, nineteen readers, and one darkly comedic emcee, Abe Becker, build a feeling of comfort and enjoyment so strong that it feels tangible. The musical guests, amutabi todaii and Amani Will, from the musical arm of Oakland’s Band Together Creative Liberation Network, start off the night with its playful and raw, honest vibe. Like many others who will follow them, they unabashedly read their new work from their phone screens. Others pull out crumpled pieces of paper they have been editing as the night progresses. Although unpolished and never-before-read, the pieces don’t feel amateur. As Paul Corman-Roberts, a co-organizer of the event, says, “nervous energy just really works.” And although the room is nervous, everyone is also cozy and content — like home, but in a temporary kind of way. Get Lit #27, Tuesday, August 15, 7-9:30pm, donations accepted, 3096 East 10th St, Oakland, NomadicPress.org.